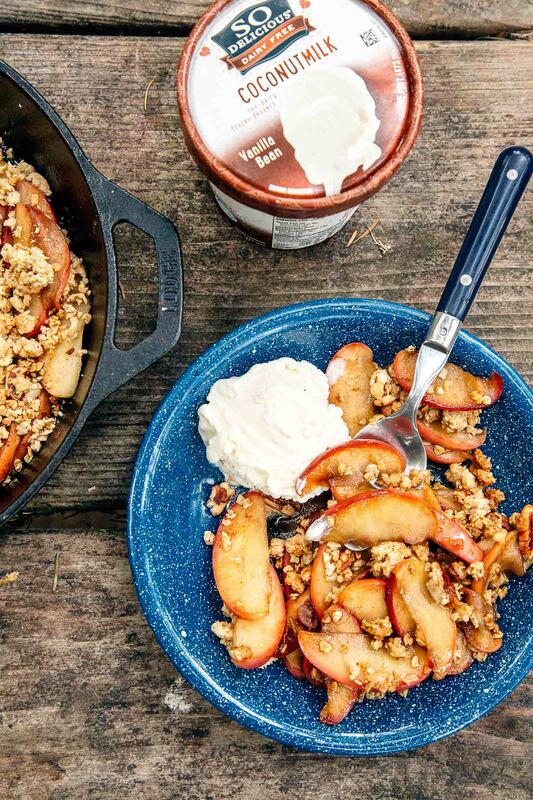 A quick and easy fall-inspired camping dessert, this vegan campfire apple crisp is guaranteed to leave you feeling warm and cozy at the end of the night. 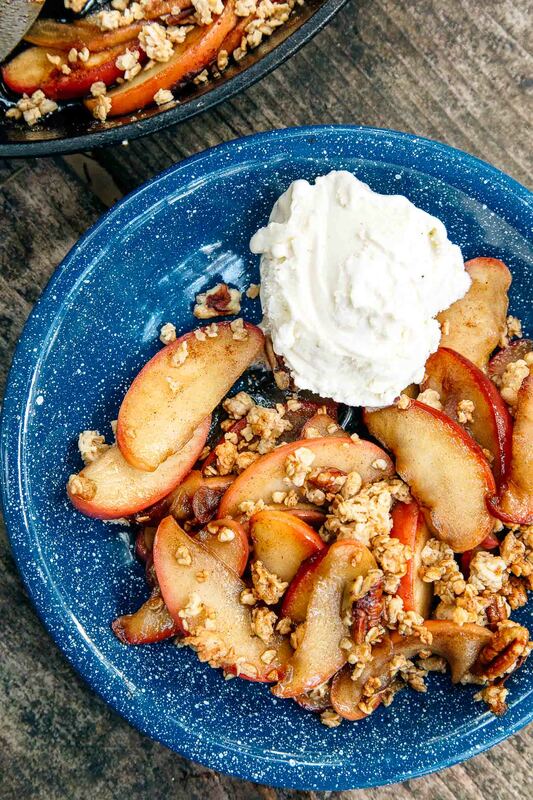 This no-bake apple crisp is designed to be an afterthought of a dessert. Something so simple it’s hard to think of a reason not to make it. So on your next camping trip, treat yourself to something sweet. The dishes can wait – you’ve still got dessert coming! 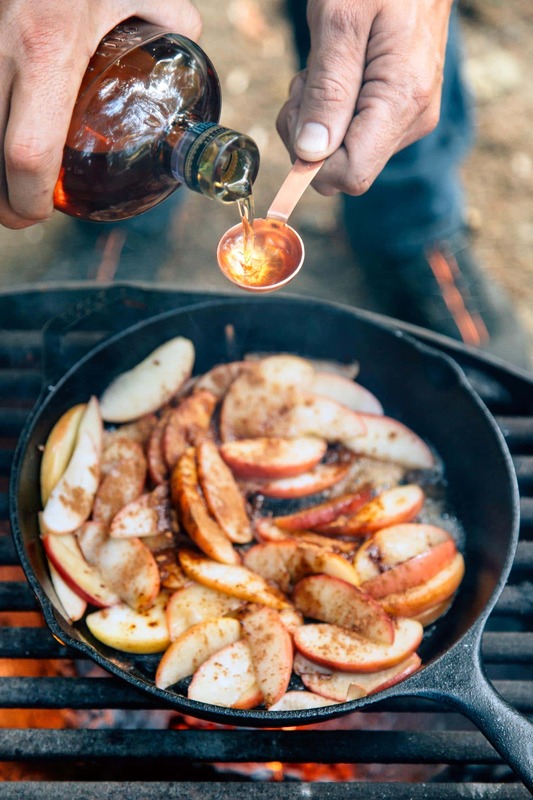 What’s really nice about this recipe is that it uses a lot of common camping ingredients: apples, granola, cinnamon, brown sugar, and bourbon. These are things you might already be picking up anyways and can be repurposed to make dessert. 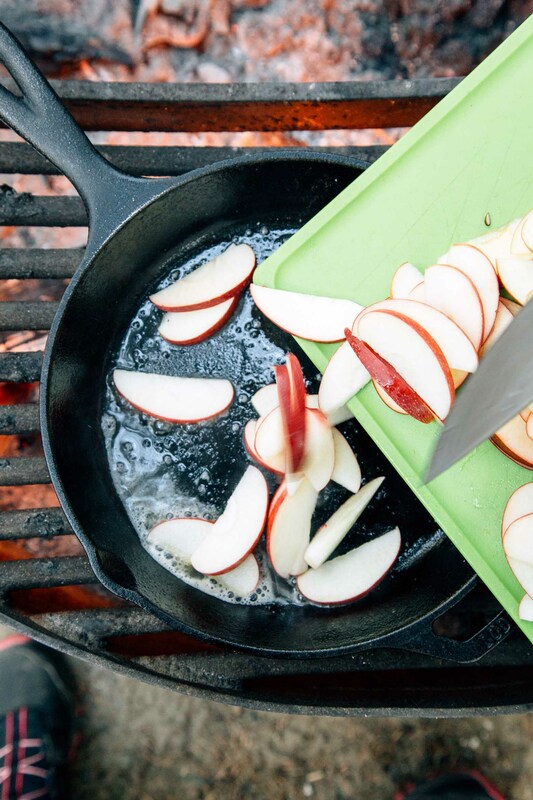 To start, preheat a cast iron skillet over a campfire or camp stove while you cut a few apples into thin slices. Toss them into the skillet and let them cook down until they start to get soft and release some liquid into the pan. Then add your brown sugar, cinnamon, and a shot of bourbon. Mix together over the heat to burn off the alcohol and reduce the liquid slightly. Once the liquid starts to thicken, remove from the heat, sprinkle your favorite granola on top, and you’re done… almost. While you could serve this dessert on its own – we highly recommend leveling up to the “a la mode” version. 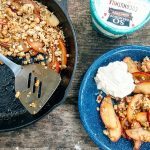 We recently paired this apple crisp with a few scoops of So Delicious Dairy Free coconut ice cream. Not only does the smooth coconut play well against the apple cinnamon flavor, but the coconut base means the ice cream is completely dairy free. That’s great news for vegans and lactose intolerant individuals (like ourselves). Now, keeping ice cream solidly frozen while camping can be tricky – even with a state of the art cooler. So if you want to enjoy ice cream with your dessert, we recommend doing it on your first night out. Thankfully, a pint is the perfect size for a group of four (1 scoop each) or group of two (2 scoops each). If you plan on enjoying some fall season camping, then this is the dessert for you. Throw another log on the fire and cozy up with this comforting dessert. Right now So Delicious Dairy Free is offering our readers $1 off any one So Delicious Dairy Free product. Click here to receive the coupon. Learn more about their lines (including their dairy-free cheeses and yogurts!) here. 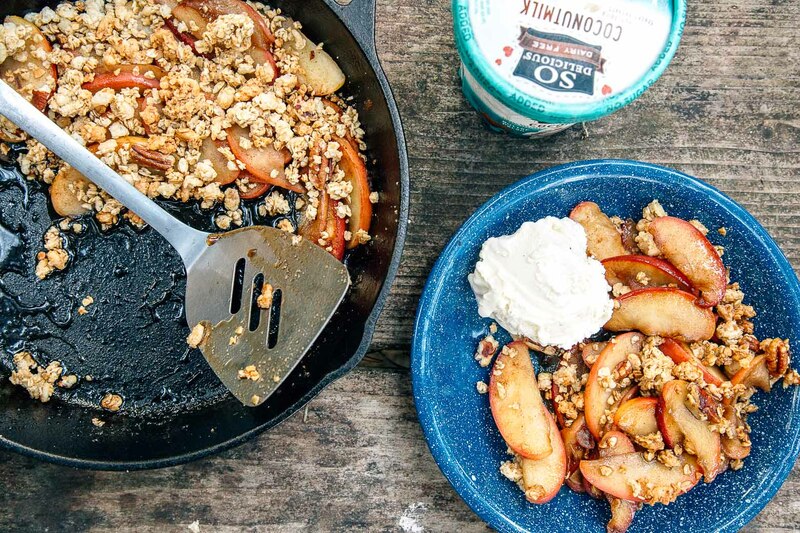 A quick and easy fall-inspired dessert, this vegan campfire apple crisp is guaranteed to leave you feeling warm and cozy at the end of the night. In an 8" or 10” cast iron skillet, over medium heat, saute the sliced apples in a bit of oil or butter until beginning to soften, about 5 minutes. Add the spices, bourbon, and sugar, and stir to combine. Continue cooking until the sauce thickens and the apples are tender, 5-10 minutes. Remove from the heat and sprinkle the granola evenly across the top. Enjoy straight from the skillet or serve in individual bowls with a generous scoop of So Delicious coconut ice cream! 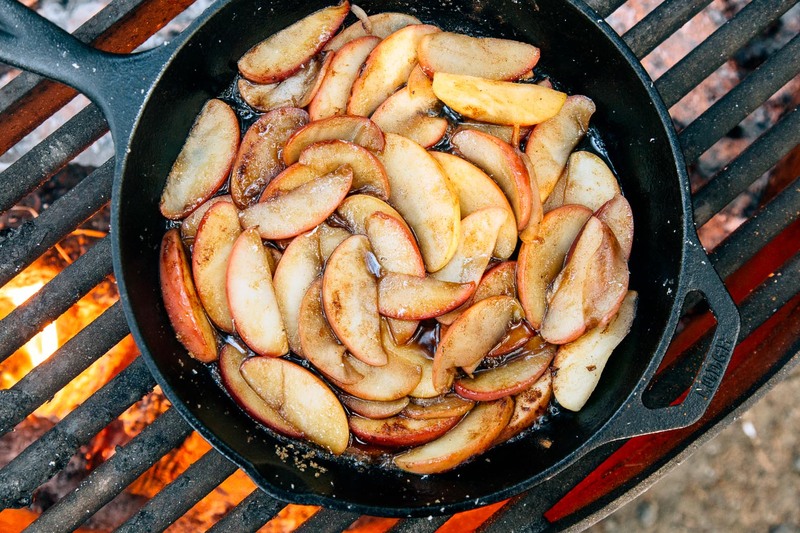 We love this recipe and can’t wait to make a campfire to try it out. Perfect with some So Delicious Dairy Free Ice cream! Could you suggest alcohol free bourbon substitute (will it still taste great without bourbon?) ? You can skip the bourbon if you’d like. It’s not essential. But if you wanted to add something to replace it, a teaspoon of vanilla would be nice. Perfect for a beach side picnic with my family! Thank so much for this wonderful recipe. 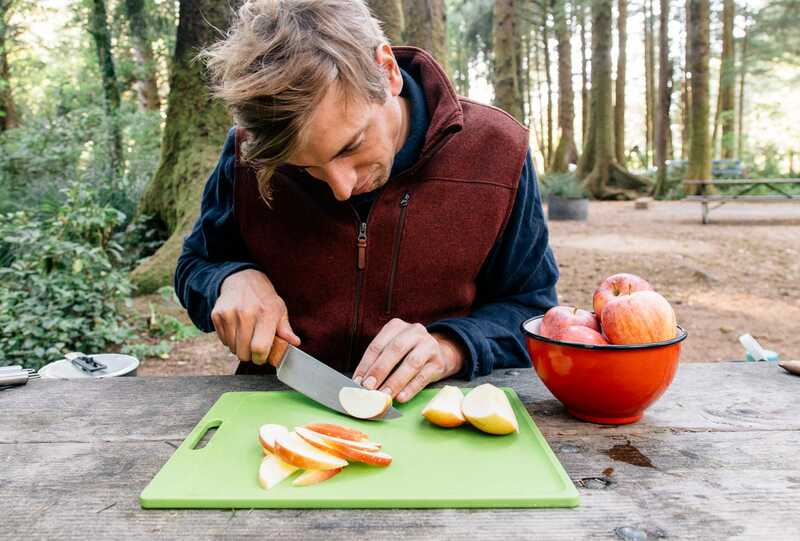 Guys, normally I don’t have any dessert when I go camping, but this recipe changed that! Made this over the weekend while camping along the Conejos River and it was delicious! Thank you for sharing. We did have to cook the apples longer than 10 minutes, but that was likely due to our campfire setup. PS: We were brainstorming all sorts of fruit variations we could do around the campfire. Can’t wait to try out a peach version and a blueberry version. Yumm! It looks and sounds SO delicious! !